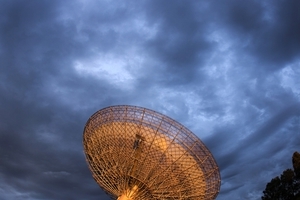 The Parkes telescope has been in operation since 1961, and is the largest fully steerable dish radio telescope dedicated to radio astronomy in the southern hemisphere and fourth largest in the World. Astronomers use the telescope to measure naturally-produced radio energy from space. On occasions, it has also been used to receive signals from space craft such as the Apollo 11 moon landing. Despite its age, it is still a world-class research instrument, and is over 10 000 times more sensitive than when it was first commissioned. The Parkes telescope is the largest of several antennas in the Australia Telescope – a giant radio telescope that stretches over several hundred kilometres across western New South Wales. It is operated by the Australia Telescope National Facility (ATNF), a division of the CSIRO. The shape of the telescope in this picture is distorted by a wide angle camera lens.